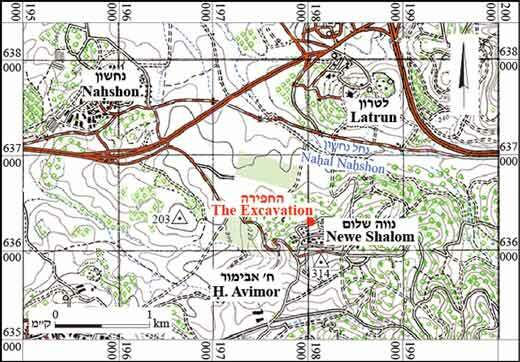 During November 2011–January 2012, a salvage excavation was conducted in Newe Shalom (Permit No. A-6323; map ref.19810/63630), prior to the expansion of the communal village. 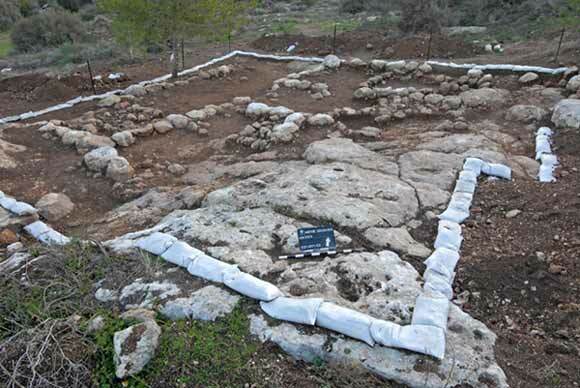 The excavation, undertaken on behalf of the Israel Antiquities Authorityand underwritten bythe Newe Shalom Local Council,was directed by D. Storchan, with the assistance of N. Nechama (administration), A. Hajian (surveying), A. Peretz (field photography), and A. Nagorsky and P. Betzer (IAA Judean district). Newe Shalom is located south of the Latrun monastery and southeast of Qibbuz Nahshon (Fig. 1). 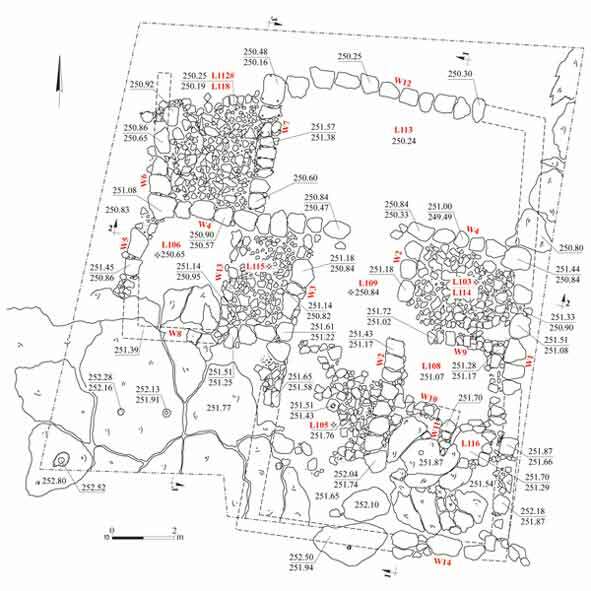 Prior to the excavation, mechanical probe trenching was conducted with archaeological supervision on the northern slope of Newe Shalom, within the area of the proposed expansion; remains of multiple terrace walls and a large structure were discerned. 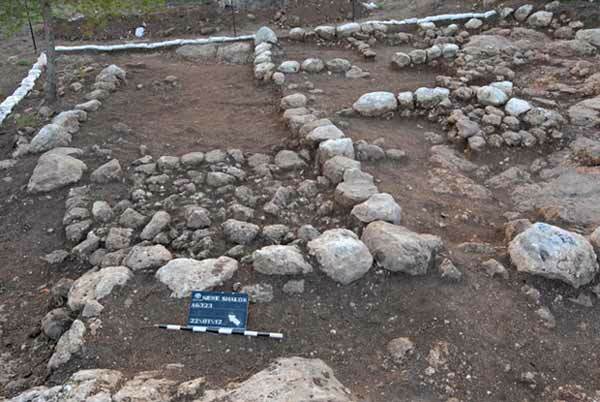 The ensuing excavation uncovered the remains of a simple agricultural terrace and a single stratum multi-roomed farmhouse dating to the Intermediate Bronze Age (IBA; Figs. 2, 3). The partially exposed tops of the structure's walls indicate a generally rectangular plan (13×15 m). The walls are preserved, in most cases, a single stone course high. The building consists of an entrance corridor (L112), a rectangular open courtyard (L113), and three rectangular side rooms (L106, L108, and L109). Entrance corridor 112 and Courtyard 113: The main entrance (width 3 m), located in the northwestern corner of the structure, between Walls 6 and 7, led into a square corridor (3×3 m; Fig. 4). Two lower set stones within W7 and close to the join with W4 delineate an entranceway into Courtyard 113 to the east. The rectangular courtyard (3.5×8.0 m) occupies the northern façade of the structure. (3×9 m), were apparent. The room can be divided into an upper (southern) and lower (northern) sections. A partial stone pavement was uncovered in the southern portion of the room. The southern (W14) and a large portion of the western (W3) walls of the room were not preserved. A large flat topped stone, uncovered in the center of the room and sunk into a packed earthen floor, served as a pillar base. This northern sloping floor covered the entire northern portion of the room. Room 106: The southern half of Room 106 (3.5×9.0 m) was not preserved; however, its original size can be reconstructed based on an assumingly symmetrical building plan. 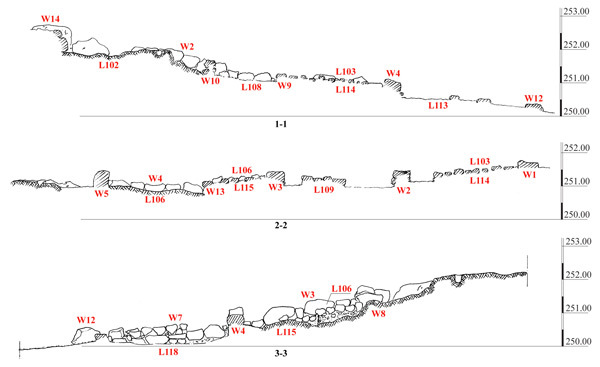 Both western (W5) and southern (W14) walls would have extended to form the buildings’ southwestern corner (Fig. 5). The room is bisected and halved by a natural dip in the bedrock and an inner division wall (W8). A stone pavement, whose western extent abutted a wall (W13), built of medium fieldstones, was uncovered to the north of W8. Room 108: A gap (width 1 m) in W2 provided access from Room 109 to Room 108. A wall (W9) at the entrance, built of a single row of medium-sized fieldstones in an east–west orientation, divided the long room into smaller spaces (Fig. 6). A layer of medium-sized fieldstones was uncovered in the northern section of the room (L103; 2.5×3.0 m). The partial remains of a low-cut bench, built alongside W1, were uncovered to the south of W9. The excavation uncovered the complete plan of a multiple-roomed structure. The shallow topsoil cover, modern agricultural activity, and natural erosion processes in the area allowed for only moderate preservation of the building’s packed-earth floors. Based on the limited ceramic remains, the construction of the building can be dated to the IBA period, as all dateable potsherds from loci under clear floor contexts belonged to this period. 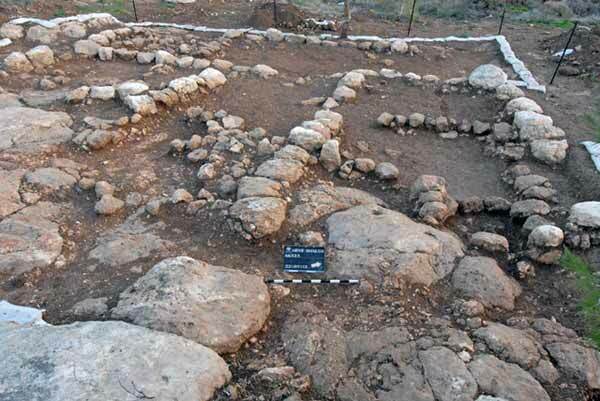 The plan, style, and construction of the building uncovered at Newe Shalom resemble other structures from the IBA period in the area. 4. Corridor 112 and Courtyard 113, looking east. 5. Room 106, looking northeast. 6. Room 108, looking north.